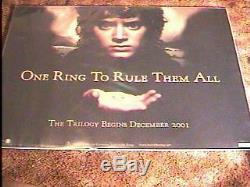 LORD OF THE RINGS ADVANCE FELLOWSHIP OF RING-- ORIG DOUBLE SIDED BRITISH QUAD (30"X40") MOVIE POSTER. THIS POSTER IS IN EXCELLENT CONDITION & ROLLED. THIS POSTER IS NOT REPRO OR REPRINT , THIS IS AN ORIGINAL THEATRICAL ONE SHEET MOVIE POSTER PRINTED BY NATIONAL SCREEN SERVICE. The item "LORD OF RINGS FELLOWSHIP ADV BR QUAD MOVIE POSTER DS" is in sale since Sunday, April 12, 2009. This item is in the category "Entertainment Memorabilia\Movie Memorabilia\Posters\Originals-International\1990-99".